Why have the Estonian Fund for Nature, Estonian Semi-natural Communities Conservation Association and the Estonian Ornithological Society joined more than two hundred NGOs in the demand for a radical reform of the Common Agricultural Policy? The answer to our unruly behaviour has been partly given in the previous post from 3rd of April. That post is also the base for what will follow below, so it might make sense to give it a (second) look. Together with colleague Kuno Kasak we have checked if a common-sense understanding that a subsidy with unspecified goal – that is the case of CAP Pillar I direct payments – would actually support (over)procurement of fertilisers, fodder and pesticides, with all the environmental damage as a result. The uneven distribution of direct payments between the member states – however unjust – provided an easy way to compare it to the values of agri-environmental indicators for the same countries. Relevant data are publicly available from Eurostat. The hypothesis is supported: the higher the payments the worse the environmental problems. The paper has been recently published in Estonian (Lotman ja Kasak. Euroopa Liidu ühine põllumajanduspoliitika – kas ka päriselt roheline? Akadeemia nr. 3 – 2017)* and another one in English has been submitted for publishing. To get an idea, take a look on relation between the direct payments and Nitrogen balance. Every dot on the graph shows a member state, with average direct payments and balances per hectare presented on the x and y axes. EU Common Agricultural Policy direct payments are shown to constitute an environmentally harmful subsidy. We analyse the link between payment levels in different EU member states and corresponding values of agri-environmental indicators. 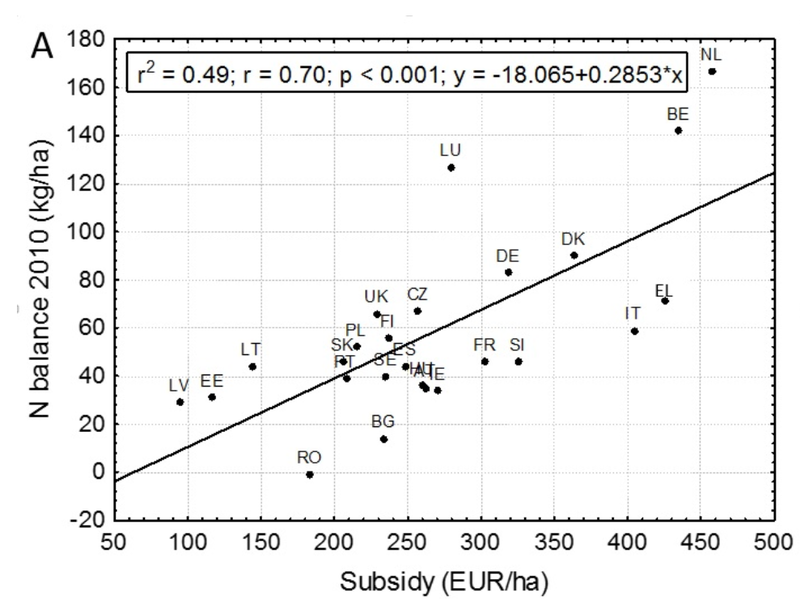 Higher payments are reliably correlated with higher nutrient surpluses (figure 1), bigger use of mineral nitrogen (figure 2), higher livestock densities (figure 3), bigger ammonia (figure 7) and green-house gas (figure 8) emissions, and use of more pesticides (figure 9). This is in a direct contradiction to the well accepted „polluter-pays” principle. We call on abolishing the current direct payments during the next CAP reform and fully implement the principle of public payments for public goods.